My, my, how fast time flies. The last State of the Station address was already a year and a half ago! Crazy, right? Anyways, here's a breakdown of Radio Hyrule's current status and future goals. Things around the website have been pretty quiet in terms of updates and changes, but that's because everything has been running incredibly smoothly. With the recent success of our first mobile application, we've started looking at making a number of improvements we can make to the website (and apps) to offer a better experience. Track Requests: Austin and I have been working on creating a solution to better handle the growing number of track requests that we process on a daily basis. We're hoping to solve this problem as soon as we can, as we know it has a big impact on listening experience. We're looking at possibly adding a voting mechanism in order to cut back waiting times for requests to be aired. Upvote/Downvote System: Like the track that's currently playing? Give it an upvote. Hate the current track? Downvote. Not only will this help us provide better track popularity statistics, it will help flag tracks that aren't well-liked so we can possibly weed them out if necessary. Streamlined Layout: The website is due for a facelift, which looks like will be ready to go during the later portion of the year. Nothing huge, but we'd like to clean up some of the useless clutter and create something that's easier to use. 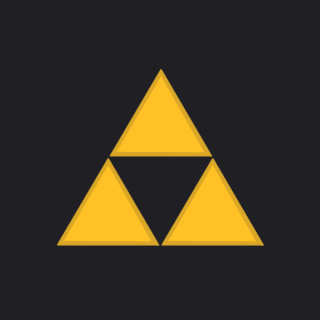 As you probably noticed, we launched a dedicated Radio Hyrule iOS app about 7 months ago and it's been a huge success. It's never been easier to listen to the music on the go and even request songs. Many thanks to all buyers for helping us maintain the app and station by purchasing the app. We've received a lot of positive feedback, and we're pretty proud of our 5-star rating we've been holding for a month in the US app store! We will continue improving the app: A new social sharing feature was added in the latest version. 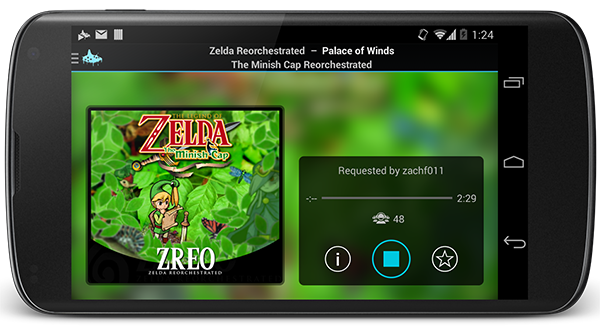 Now you are able to post on social media about what you're listening to and what you like on Radio Hyrule! But please be aware that it's work in progress and it will take more time. Because even though it doesn't look too different, it's quite a different and more diverse environment than iOS, and we still want to deliver something to you that'll be fun to use. Now is a great opportunity to share your own thoughts and ideas about Radio Hyrule. We really appreciate you listening to our radio station, and we would love to hear your suggestions. It's finally here! We're proud to announce the release of our first mobile application for iOS devices! 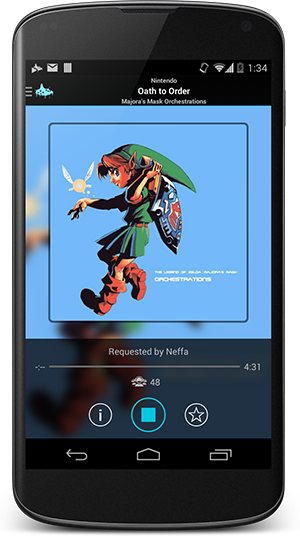 Listeners can now quickly tune into Radio Hyrule and also request songs directly from the app. For more features and information, head over to our mobile application page. 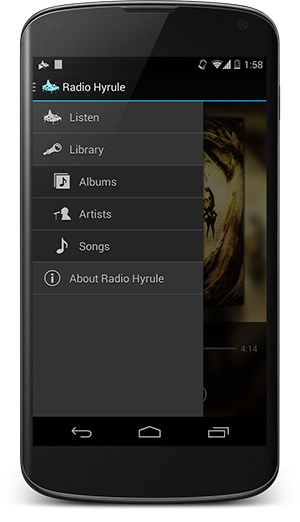 You can download the Radio Hyrule app for $0.99 using the link above or by searching the app store on your device. By purchasing the app, you are helping to fund future app development and to keep our servers online. We would like to thank everyone who spent many hours of their day with us yesterday watching the Twilight Symphony Music Video, and joined us, the Twilight Symphony team, and everyone else in the chatroom. The videos are being posted by track on ZREO's YouTube channel through the coming month. This special event was made possible because of our stream sponsors: Juan Luna, Mike Sauer, and Michael Schatz, among other donors who can be found on our Donate page. Without your contributions this event wouldn't have been possible. The Twilight Symphony Music Video marked the debut of Twilight Symphony on the Radio Hyrule library. Check it out! Since its creation, Radio Hyrule has been a Zelda Reorchestrated project. With the announcement that ZREO as a project has ended, Radio Hyrule is being spun off as a completely independent project, and will remain running and continue to serve the fan community for the foreseeable future. You may have noticed we have not added Twilight Symphony to our library. For the past several months, Radio Hyrule has been working on a music video, footage of which has been used by the Twilight Symphony team in promotional videos and for the January 2013 premiere at MAGFest. For the Radio Hyrule premiere of Twilight Symphony, wish to broadcast this four-hour music video in its entirety, in HD, to your computer and Wii U consoles. The Twilight Symphony Music Video will be appearing on Radio Hyrule on Saturday, May 4th at 16:00 EDT/13:00 PDT/20:00 UTC. Don't miss this, RSVP to the event on Facebook. The first tracks are being posted on YouTube now, take a look at Overture to see a trailer! However we will need some help, streaming high quality video is expensive, so we are seeking help to fund the event, being titled "One Final Tribute" [to Twilight Princess]. Donations above $60 will be listed as stream sponsors before and after the broadcast, on the Radio Hyrule website, and will receive a personalized mounted still out of the video, featuring a scene or characters of your choice. Donations in excess of our live stream costs will go towards future streaming costs and video projects. We're pioneering what we believe to be an innovative new method of live streams and we'd like to deploy this solution in the future. If you have any questions, don't hesitate to use the Contact Us form. Once again, it's time for another Zeldathon! This time the marathoners will be playing games for five days straight to raise money for charity: water. Enjoy! Read more about Zeldathon for Charity! A week from tomorrow, GameTrailers will be launching the first episode of a new video series that takes a close-up, in-depth look at the Zelda timeline. "The Legend of Zelda: Timeline" has been in the works for several months under the direction of GameTrailers associate editor Mike Damiani. This is definitely something you'll want to check out, especially if you're a Zelda theorist. Watch the trailer! Link has been many places. Several different continents/islands, a few different time zones, and a parallel universe or two. Now, with the help of technology and some creative inspiration, Link is able to journey through the digital realm to save Princess Zelda. Check out the video below and stop by their channel again tomorrow to see how they pulled it off! If you'd like to hear Radio Hyrule on your television or home theater system with Wii, go and open up your Wii's Web browser to wiimusic.net. You can find Radio Hyrule under the "Soundtrack" category!